I just finished a search in the N. T. for all the verses that speak of us abiding IN Jesus as our life and all that is ours as we rest IN Him and it filled up eight pages of small type! Do you want to do God’s will for your life, abide IN Christ! Everything we need and all that the Father has for us is found IN Him as we abide in the Son. A vine dresser must slit the bark of the vine and graft in a new bud for there to be new life which will bring forth the fruit he desires. Then he prunes it as it grows. As we abide in Christ the Vine, the Father prunes us that we might bring for more of the desired fruit unto Him. The Father grafts us INTO His Son when we believe with saving faith and even that faith is given us by Him! Just as the veil of the temple was torn from top to bottom as Jesus died on the cross, so was His flesh torn so that we could be grafted INTO Him and then abide there for eternity. Our part is to abide in the Son where the Father has placed us. We rest in His finished work and then He makes the spiritual fruit come forth. What shall we say to the Father if we neglect so great a salvation? Abiding and resting in His Son is the key to everything He requires. Writing about the fallen state of the visible church is not my favorite subject, but I was confronted with something this last weekend that I must address. How long has it been since you have heard the good news of the Kingdom of God preached in a church? How long has it been since Jesus was so presented to you in a sermon that all you wanted to do was get alone with Him and press ever deeper into His presence? Do we even know what our high calling IN Jesus Christ is, “In HIM we live and move and have our being”? How far will we take, “being all things to all men” in the name of “relevance”? I went to visit a brother and his family in a near by state over the weekend and he invited me to “go to church” with them in a nearby large town in the area. It was called “Skull Church.” I kid you not! The “pastor” (a young guy of less than 30 years) wasn’t even in the building but telecasting his sermon live from another location to the satellite churches he had started (so much for a close pastoral touch or home visit… and they call them “shepherds”? ).They had a very loud rock band that did the “worship” and the place was painted in dark colors and in the dark during the “worship” and the “sermon.” All this was to attract the youth and appeal to them and their feddish for loud rock music and wearing white skulls on their black clothes and on the back of their vehicles. And get this, the sermon was about Satan. As Satan continues his onslaught on the world and our youth are turning wholesale to homosexuality and start wearing falex symbols on their clothes will the churches follow suit that they might be relative? How far must the testimony of Christ be drug through the dirt in the name of reaching those in the dark? I finally got up and left after about half way through “the sermon” and felt totally drained. How much lower will churches go under the guise of being “more relative” to the world in its fallen state? Whatever happened to being relative to the kingdom of heaven and giving the lost a choice between the devil’s kingdom of darkness in this world and God’s kingdom that is illuminated by His light? Did Jesus sleep with the halots and collect taxes for the publicans so they could relate to Him? Did He help Annis with his bazar and money changing tables in the temple that He might be more “relevant” to the religious Jews? Not hardly! And he called out with a mighty voice, “Fallen, fallen is Babylon the great! It has become a dwelling place of demons, a haunt of every foul spirit, a haunt of every foul and hateful bird; for all nations have drunk the wine of her impure passion, and the kings of the earth have committed fornication with her, and the merchants of the earth have grown rich with the wealth of her wantonness.” Then I heard another voice from heaven saying, “Come out of her, my people, lest you take part in her sins, lest you share in her plagues; for her sins are heaped high as heaven, and God has remembered her iniquities. He was a shinning Light in a dark world and was in the world but not OF the world and the true body of Christ is called to carry on in that same Light until He returns, not hide that light under a bushel. Frankly, I think the salt has lost its savor and that Jesus has left the building and it is time for us to do the same. Vanity or Intimacy with Jesus? Intimacy is destroyed by pride, vanity and seeking recognition for ourself instead of drawing closer to and being absorbed with the one whom we love. I remember a guy I was on a ship with in the navy. He was so proud of himself for marrying a good looking and shapely wife. He even was showing off her photographs to the crew that should have remained private. The only thing he didn’t do was sell copies of the photos to his shipmates. Anyway, to say the least, that marriage did not last for very long. So many want to see unity in the church. How can there be unity when we who call ourselves “Christian” are finding our identity in everything but Jesus who is the Head of the church? We are divided by doctrines, spiritual gifts, hierarchical titles, race, gender, and denominations. Only when Jesus is our All and in all will there be unity in the church and only those who are one in Him are assembled together beyond the veil IN Him. Those who have put on Christ, live IN Christ and not for themselves. They tabernacle with Him. Neither the Passover (salvation from sin) nor Pentecost (gifts of the Spirit) is their total identity for these are only part of what Jesus has done for them. They have moved on beyond the outer court and the inner court and passed through the torn veil of His flesh and abide IN Him as their Life. To get there the old Adam in them had to die. Death continues to work in them that the life of Christ might abound in others. You can tell those who have passed through the veil, their lives are no longer about themselves, power or their spiritual gifts. They are all about Jesus, and posturing over others, seeking power and garnering titles to themselves will not be found among them for Christ is their sufficiency. True unity is only found beyond the veil in Christ. As we surrender our lives over to Him and make Him our life, unity with Him and each other will happen. God has put a hunger in each of us and until we pass through the veil of His flesh and abide their in Him, we will be hungry to find fulfilment. The trouble is that most of us will try to fill that hunger with other things… things that will pull us away from Him. This is why we see so many believers, even so-called church leaders, falling into sin. Yet, Jesus is persistent. He keeps calling us into the presence of His Father and is always our High Priest who stands before Him, making intercession for us. I have never notice the importance of the context of verse 39 before today. It happened while fellowshipping with a dear sister in Christ who lives in South Africa. The cross of Jesus, the one He has made for us to bear, has cut us off from finding our life in this world. As a result the life of the cross can be very lonely. I know that many of you who follow this blog know what I am talking about. But isn’t it interesting that Jesus did not leave this discussion with only the losing of one’s life, a life cut off, hidden and alone? No, He gives us a promise of finding our higher life in the Spirit with comfort along the way. He goes on to speak of even finding a life on this plain… one where we are not always rejected by the people on this earth. He speaks of those who have taken up His cross as being received, welcomed and accepted by others who have also received, welcomed and accepted Him. Jesus knew how lonely this life of following the will of His Father could be and it is as if He is making provision for us to not always be alone and rejected. There are those who receive His prophets and those who have found their righteousness in Him and who respond to His life in us. There are even those who receive the least of His brethren in His love. It is as if the Lord is making provision for those who are pilgrims that we would receive encouragement along the path He has set before us. He is even offering those who show us His love and kindness a reward for doing so. I know that for many of us, these “love oasis” have been few and far between, but even in that Jesus has made a provision in promising that He would not leave us alone, but would come to us again in the form of the Comforter, the Holy Spirit. It is interesting that even thought the Spirit gives us spiritual powers, he is not called “The Empowerer,” but the Comforter. Jesus knew that we would need comfort on this journey and that our fellow believers would not always be there to provide it. A life alone and set apart seems to be the norm for those who have chosen the way of the cross. Yet, in all this, loneliness is not the goal, but part of the flesh killing process that we must go through that we would have no confidence in ourselves. One time a pastor asked me how I was doing. I said, “Not to bad… under the circumstances.” To this he replied, “What are you doing under there?” We are promised that we who persevere will find our higher lives in Christ where we sit together with Him in heavenly places with the Father. I often marvel at the spiritual place where Paul and Barnabas were in that Philippian jail. They were first whipped and then chained to the wall in a darkened dungeon. Yet, they were singing their hearts out with praises to the Lord in that very situation. I think that they were more caught-up with the presence of the Lord than with their circumstances. Recently, I dreamed that I was totally in Jesus. There I slept in perfect peace, harmony, and unity. Nothing seemed to be lacking in that state. I was so shocked that I awoke. I went back to sleep praying to experience it again, and again He let me abide there in my sleep. I woke up in the morning quite rested. The experience was very real. God wanted to show me something that I had only known in theory from reading the scriptures. “In Christ Jesus” is a phrase we see all through the epistles of the New Testament. What does it mean? We say to others, “Do you believe in Jesus?” Yet, are wein Jesus ourselves when we ask it of others? There is a great difference in believing in someone or something the way we do in our culture and really, fully believing in Jesus. First, we are mislead by the mistranslation of many verses that have to do with our salvation. For instance, in John 6:29 we read, “Jesus answered and said unto them, This is the work of God, that ye believe on him whom he hath sent” (John 6:29 KJV). All we have to do is “believe on” Jesus. In John 3:16 we read, “For God so loved the world, that he gave his only begotten Son, that whosoever believeth in him should not perish, but have everlasting life.” Every Sunday school child can parrot this verse. This is all straight forward. We just believe on or in Jesus and we are saved. In our culture to “believe in” someone is to account them as trustworthy. We believe in our elected officials (as long as they are the ones we voted for). We believe in our home football or baseball teams and root for them all season. We even believe in Ford pickup trucks! But is this what this famous verse we hang our salvation on is really saying? The part of these two verses in question of which I speak is this, “believe on” and “believe in” Jesus. The word translated “on” and “in” here is the Greek word ice. Its real meaning is into, not on or in. When it comes to true salvation, true belief is when we believe INTO Jesus. Through the faith of Jesus that He places in us, we are brought totally into Him in perfect intimacy. This kind of faith is way beyond simply believing in an elected official or a baseball team or a manufacturer’s product. Believing in is defined in the Amplified Version of John 3:16 as one who (trusts in, clings to, relies on) Jesus Christ. This comes far closer to our callings than the way we culturally use the word “believe.” Yet, there is more to this believing INTO Jesus than most of us will ever know. Jesus comes into us to make His abode. But does He stay there all shut up inside while we continue to live our lives as we see fit? When Jesus comes into us, He comes to take over, not just to live in seclusion. 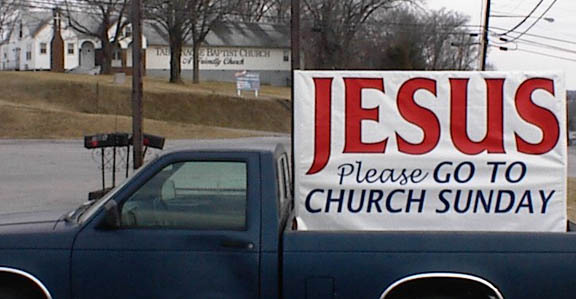 The bumper sticker that reads, “Jesus is my co-pilot” totally misses the mark! Is that all there is when it comes to the kingdom of heaven and “being saved?” Is Jesus just along for the ride and there to be called upon whenever we lose control or need a rest? I think not! Jesus comes into us so that He might continue to grow in us. Paul wrote, “God has put all things under the power of Christ, and for the good of the church he has made him the head of everything. The church is Christ’s body and is filled with Christ who completely fills everything” (Ephesians 1:22-23 CEV). Jesus is planted within us as a lowly mustard seed and He desires to grow in us until He becomes the greatest of all herbs, filling us up to overflowing. The goal of the gospel is that we might manifest the glory of the Father as we abide in Christ Who finally takes over both within us and without, filling the whole church, manifesting to the world the body of Christ in action that the Father might once again be glorified in His creation. First He not only was praying for the disciples who believed in Him, but for all who would believe in Him in the future as the good news of Christ’s kingdom spread through the whole earth. And what was that prayer? That we ALL might be one just as Jesus and the Father are one. He defines that unity, “as you Father in me and I in you that they might all be ONE IN US. If we are not living IN Christ, we have not yet known His glory that He has IN the Father. Jesus is in the Father and the Father is in Jesus and we who truly believe are in them and they are in us. This is true unity. Only by living in Christ are we filled with all things that Father has for His sons and daughters. Paul wrote, “And of him are you in Christ Jesus, who of God is made unto us wisdom, and righteousness, and sanctification, and redemption: That, according as it is written, He that glories, let him glory in the Lord” (1 Corinthians 1:30-31 KJ2000). As we abide in Jesus, we have everything we need to function in His body, the church. As we abide in Jesus all religious divisions are done away with, “For in Christ Jesus neither circumcision avails anything, nor uncircumcision, but a new creation” (Galatians 6:15 KJ2000). We are made new creatures in Christ (see Jeremiah 31:31-33 and Ezekiel 36:26&27) and abide in a whole New Covenant totally unlike the Old Covenant! We are no longer of, nor do we live for this world. We no longer rely on our old natures to do the will of God. Paul wrote, “And [God] has raised us up together, and made us sit together in heavenly places in Christ Jesus” (Ephesians 2:6 KJ2000). Jesus sits at the right hand of the Father, and as we live in Him that is our abode as well. It is there that we can say with Paul, “…For all things are yours [ours]; Whether Paul, or Apollos, or Cephas, or the world, or life, or death, or things present, or things to come; all are yours; And you are Christ’s; and Christ is God’s” (1 Corinthians 3:21-23 KJ2000). “For in him we live, and move, and have our being….For we are also his offspring” (Acts 17:28 KJ2000). Obedience to the Father and knowing His will are no longer an issue, either. We simply abide in Him and listen to and observe Him and carry out His will. Jesus said that He only did the works He saw His Father doing and only spoke the words He heard His Father saying, and so it should be with us as the sons and daughters of God. To me, this IS the high calling of Jesus Christ. Everything else is just dead religious works, living as carnal Christians. Just because we read something in the Bible does not mean that we have a mandate to go do it in and of ourselves. Our real lives are in Him, always abiding in and resting in Him and only from that position of rest can we consistently act under the influence of the Spirit. We start out in our Christian faith first by believing in Christ and learn that Christ in us is our hope of glory. But that is not all. We then are called ever deeper INTO Christ. First Jesus abides in us, but as it is with Him and the Father we go deeper. We are called to abide in– live IN Him! As Jesus is in the Father, and the Father in Him, so it is to be with us. God invites us to share in His glory, the glory that comes over us when we abide IN Them. Jesus taught the disciples, “I am the true vine, and my Father is the vine dresser. Every branch in me that bears not fruit he takes away: and every branch that bears fruit, he prunes it, that it may bring forth more fruit. Now you are clean through the word which I have spoken unto you. ABIDE IN ME, and I IN YOU. As the branch cannot bear fruit of itself, except it abide in the vine; no more can you, except you ABIDE IN ME. I am the vine, you are the branches: He that ABIDES IN ME, and I IN HIM, the same brings forth much fruit: for without me you can do nothing” (John 15:1-5 KJ2000- emphasis added). Here we see the same thing as Jesus prayed two chapters later. Jesus not only wants to live in us, but He wants us to live IN Him. This is when true spiritual fruit starts to happen in our lives. When Jesus lives only in us, which is often spoke of in Christian circles as the goal of our salvation (inviting Jesus into our hearts), what do men see? They still see us on the outside of the relationship. We are still being manifest, though we rely on Him as our salvation and righteousness. But where is the glory of the Father in all this? The glory that Jesus shared with the Father comes not only from Jesus living in us, but when WE are also living IN Jesus. He is the one who is on the outside. He is the One who people see. Until we are also in Him, we have not been made “perfect in one” within the Father and the Son. It is by abiding in the unity of Father and the Son that the world will see the good news of the gospel in action. What Kingdom Are We of? We know that Jesus was perfect in all His ways before God. What does it mean to be perfect in the eyes of our heavenly Father? Can we have such perfection? When Jesus stood before Pilate being tried for His life, the man asked Him what He did to deserve crucifixion which the Jews, His own people, demanded. His answer was simple, “My kingdom is not of this world; if my kingdom was of this world my servants would come and fight.” Anyone that is found in this world that is not of the world religious/political system, but of the kingdom of God is an anathema to them and it. Just as Jesus was hated, called names and despised, so are they. This is why He said, “If the world hates you, you know that it hated me before it hated you. If you were of the world, the world would love its own: but because you are not of the world, but I have chosen you out of the world, therefore the world hates you” (John 15:18-19 KJ2000). Jesus was not of the kosmos (world)– that system that controls the world and the satanic intelligence behind it. Jesus describe Satan as “the prince of this kosmos (world).” He said, “The prince of this kosmos has come and he has found nothing in me.” Satan could find nothing in Jesus to tempt Him over. If we have crucified the flesh and the lusts thereof, he can not find anything is us to use against us, either. Jesus also told the religious leaders of that day, “You are of your father the devil, and the lusts of your father you will do.” Jesus did not have an army, but the temple priests did. Peter drew his sword to do harm to the High Priest’s servant as Jesus’ self-appointed body guard and Jesus rebuked him. Today we see every nation and despot with his own army to protect and enforce its/his will, even big time preachers and evangelists have their own body guards. Even the ushers in churches are taught to operate in this capacity. Their actions show what kingdom they are of.